PLYMOUTH, Ind. - May 13, 2016 - Brad Sweet captured the lead from pole-sitter Joey Saldana early, then held off a challenge from teammate Daryn Pittman late in the race to claim the World of Outlaws Craftsman® Sprint Car Series inaugural race at Plymouth (Ind.) Speedway Friday night. Sweet's victory, his first since Bakersfield Speedway on April 15, is his sixth of the season which breaks a tie with seven-time World of Outlaws champion Donny Schatz for most in 2016. "Typically, I'm not that great on these quarter-mile tracks, but for whatever reason, this year with this package we built it seems we are better on the short tracks but need to get better on the half-miles," Sweet said. "That's part of racing - you're always searching and trying to find things. It's great to get another win under our belts and build momentum." The Grass Valley, Calif. -native was never able to build a large lead during the 30-lap feature as he had to fight around Saldana early, then fend off tonight's quick-time Logan Schuchart during the middle stages of the race, and finally hold off Pittman at the end for the win. "It was a great effort by our Great Clips team - congrats to Brad, he did a heck of a job," Pittman said. "We have been running good, just have a lot of second place finishes and we want a win. Kale [Kahne] and Michelle had their baby boy on Tuesday so that was a pretty awesome week for them, just would've liked to get them a win." At the beginning of the day, Schuchart appeared to be the man to beat after setting a new track record during qualifying. Unfortunately for Schuchart, the dash draw did not work out in his favor as he had to start at the rear of the six-lap race. Saldana, in the No. 83 Roth Enterprises/HR Livestock car, started from the first position and dominated his way to the victory and the pole position for the feature. Once the green flag fell, Saldana pulled out to an early lead, then held off second-place starter Sweet on an early race restart. Following a second early-race caution, Sweet, in the No. 49 Ollies Bargain Outlet/Sage Fruit car, was able to get the jump on the leader for the top spot, as Saldana slid back into the field. When his slide ended, Saldana was marred in the fourth position behind Sweet, Pittman and Schuchart. As the laps winded down, Sweet maintained his lead but his teammate in the Great Clips/Team ASE No. 9 remained glued to his bumper. "Daryn [Pittman] would shorten the corner up and gain ground on me and put pressure on me," Sweet said. "I knew I had the lane covered, I just needed to not make a mistake. "My guys gave me a great race car all night. Once we got the lead, I had a really good car, I just needed to move around a bit there in lapped traffic." Pittman tried on several occasions to muscle his way around Sweet but could never complete the pass as the leaders navigated through slower traffic. As Sweet and Pittman fought lapped traffic and each other, a hard charging David Gravel had managed to claw his way from the 14th starting position to crack the top three. Gravel, in the Big Game Treestands/JRC No. 5, joined the Kasey Kahne Racing with Mike Curb cars in the battle for the top spot but came up just short of claiming his second win of the season. "The track changed and I was able to kind of find the line but Brad had the advantage because he was leading," Pittman said. "We were so much better than him in the middle of three and four that I thought that was going to be the corner I was going to get him, so I was just trying to maintain in one and two. "He must've really messed up on the cushion in one and two and I got beside him. It must've looked like I was trying to pull a slider on him but I wasn't trying to pass him at that point, I was just trying to get close enough so I could pass him in three and four. Once I showed him my nose, he moved down and that was pretty much the end of the race." When the checkered flag dropped, it was Sweet who was able to lead a race-high 21 laps and hold off Pittman and Gravel at the end to claim the $10,000 to-win inaugural victory at Plymouth Speedway. "I can't thank Ollie's Bargain Outlets enough, they have been sponsoring me for about six or seven years," Sweet said. "After I won all those races with Razorback Professional Tools, they were giving me grief saying I need to get the Ollie's car back in victory lane, so it was nice to do that." Gravel captured tonight's KSE Hard Charger Award after picking up 11 spots to finish in the top 3. "The track was awesome - it widened out, there was a cushion and you could just run everywhere," Gravel said. "It's awesome running this car, starting in 14th and getting on the podium, I can't complain." 2016 Kevin Gobrecht Rookie of the Year contended Greg Wilson finished fourth, his best finish so far this year. Tomorrow the World of Outlaws Craftsman® Sprint Car Series will travel over 250 miles south to Tri-State Speedway in Haubstadt, Ind. For more race information and ticket purchasing options, visit www.WoOSprint.com/Tri-State-Speedway. 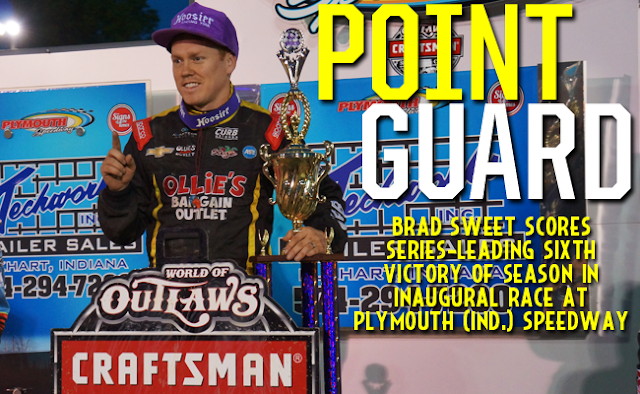 RACE NOTES: Logan Schuchart sets a new track record at 11.526 seconds...Brad Sweet claims his series leading sixth victory in 2016...David Gravel scored his first KSE Hard Charger Award of season after picking up 11 spots. CONTINGENCY WINNERS - MSD Ignitions ($25 cash): Brady Bacon; MSD Ignitions ($50 cash): Brad Sweet; Penske Shocks ($50 cash): Greg Wilson; JE Pistons ($50 cash): Joey Saldana; VP Racing Fuels ($50 cash): Kerry Madsen; Edelbrock ($50 cash): Jacob Allen; Comp Cams ($50 cash): Jacob Allen; Morton Buildings ($50 cash): Jacob Allen; Cometic Gasket ($50 cash): Jason Johnson; Super Flow ($50 cash): Paul McMahan; Craftsman/Sears ($100 cash): Jamie Veal; KSE Racing Products ($100 product certificate): David Gravel; Comp Cams ($50 product certificate): Brad Sweet; JE Pistons (Set of Rings): Terry McCarl; JE Pistons (Set of Rings): Kody Kinser. SEASON WINNERS: Brad Sweet - 6 (Volusia Speedway Park on Feb. 13, Volusia Speedway Park on Feb. 14, Cotton Bowl Speedway on Feb. 26, Ocean Speedway on April 1, Bakersfield Speedway on April 15, Plymouth Speedway on May 13); Donny Schatz - 5 (Volusia Speedway Park on Feb. 14, The Dirt Track at Las Vegas on March 4, Stockton Dirt Track on March 18, Stockton Dirt Track on March 19, Silver Dollar Speedway on April 2); Daryn Pittman - 3 (Royal Purple Raceway on Feb. 27, Perris Auto Speedway on April 16, USA Raceway on April 18); Joey Saldana - 2 (The Dirt Track at Las Vegas on March 3, Devil's Bowl Speedway on April 22); Shane Stewart - 2 (Arizona Speedway on March 6, Devil's Bowl Speedway on April 23);David Gravel - 1 (Thunderbowl Raceway on March 12); Jason Johnson - 1 (Placerville Speedway on March 24); Jason Sides - 1 (I-30 Speedway on April 26). World of Outlaws Craftsman® Sprint Car Series Statistical Report; Plymouth (Ind.) Speedway; May 13, 2016.